I brought you back a souvenir from California. Well, actually, I brought myself a souvenir and I used it to make yours. Frank and Susan sent us home with a dozen beautiful lemons from the tree in their yard. They are currently my favorite thing (Frank and Susan and the lemons)! I spent several days trying to find a dessert that would do them justice and allow their blissful citrus to shine. Luisa Weiss over at A Wednesday Chef wrote about Cory Schreiber and Julie Richardson Lemon Blueberry Buckle a few weeks ago and I quickly filed it away to make when blueberry season arrived. Well the day after we returned my mom and I donned our sun hats and waded into the blueberry field. The bushes were absolutely loaded and in about two hours we picked 9 pounds of fresh plump blueberries. I froze most of them vowing to return with Alaina this weekend and saved the rest for the Lemon Blueberry Buckle. This dessert with its buttermilk cake bottom, juicy bursting blueberries, streusel!! top!! and mild lemony sensation throughout is wonderful! 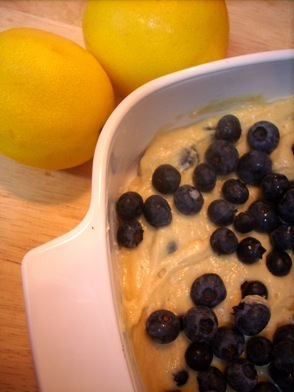 As soon as you find yourself in possession of a few lemons and some blueberries, make. this. In fact you might just want to create a situation where you find yourself in possession of some lemons and blueberries. Trust me. In a bowl, whisk together the flour, sugar, salt and lemon zest. Using a fork or a pastry blender cut in the butter until it is about the size of small peas. Cover the bowl with a loose piece of plastic wrap, and place it in the freezer while you mix the cake batter. Heat the oven to 350 degrees. Lightly grease a 9-inch square baking pan. In a medium bowl, whisk together flour, baking powder, baking soda, salt and nutmeg. Spread the batter into the pan and distribute the remaining cup of blueberries evenly over the top of the batter. Remove the crumb topping from the freezer and sprinkle it over the berries. Bake the cake for 45-50 minutes, until it is lightly golden and a toothpick inserted in the center comes out clean. If you are a particularly attentive cook you can rotate the pan halfway through the baking time, I didn’t and it still turned out wonderful. 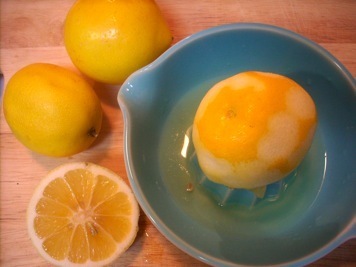 Remove the cake from the oven and drizzle the lemon syrup over the cake. Allow it to cool just slightly. I think it is best when it is still warm.